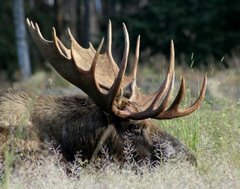 Moose Tracks: No Coal Lumps for Naughty Energy Production? Happened to hear some of this on NPR this week. It seems that coal supplies in the Midwest and East are very low -- like 2002 low, and back then our belief in the likelihood of a mild winter was a lot higher, as well as our rail capacity to correct it. We know coal is bad, we know our use of electric power is bad -- we ought to be ready to slide quietly away into the night heat-less and powerless in a frigid Midwestern winter, freezing to death with a clear conscience, fully devoid of and sense of irony as we sacrifice ourselves to keep the planet from getting warmer. But are we? Even MPR was concerned that the burden of much higher power costs might hit "the most vulnerable" harder as utilities paid high costs for transportation including trucking in the coal. Shades of "Atlas Shrugged", the production of oil that could have been transported via the blocked Keystone XL Pipeline now has to use rail -- like all resources, a limited one. That same limited resource has to be used to transport the grain harvest. Then, there is the significant factor that hit hard last winter -- when temps are low and snow heavy, the capacity of the rail network is further reduced -- power producers like Dairyland Power in W WI had to truck in coal last winter because they could not get enough via rail. We are mostly focused on giant climate marches in NYC complaining how warm it is and how warm it is going to be in 100 years, as well as some actions that may or may not be war against a foe that may or may not be Islamic half way around the world rather than out own coal stocks for this coming winter. What was that old nursery rhyme about the ant and the grasshopper again? Oh wait, kids would likely protest being taught such a thing .. and we REALLY need to listen to such wisdom!